1- ASOS // A classic black dress is perfect for any night. The lace detail keeps it pretty whilst the high neck nails the 'modern victorian' trend and the skater shape flatters every figure. 2- TFNC // Another black dress, but this time more suitable for a formal occasion. It's midi length makes it appropriate for work parties and the body con style makes it super figure flattering. I love the gold detail around the bottom which just jazzes it up a bit for christmas! 3-ASOS // If you don't want to buy a dress, a full midi skirt is a great idea to pair with any plain tops you may have. The shape also glides over any body parts you may be self conscious about and the black and silver means you won't have any trouble finding accessories to wear with it. 4- ASOS // For the more daring, a jumpsuit is a great party outfit. Especially with an all over sequin look, it makes it dressy enough but a little more fun. But, be warned sequins are very scratchy! 5- Missguided // Let's not forget that it's Winter and it's pretty cold so if we can cover up we will. This Missguided dress has just the right balance of skin on show. The long sleeves and midi length are likely to keep you warm but the lace material still offers up a hint of flesh and more colour. 6- Missguided // Face it, when we think party season we think sequins. An all over sequin dress is a winner (and the long sleeves on this Missguided one will prevent the scratching) and the iridescent greens on this dress are gorgeous. 7- Topshop // I couldn't not include a bit of fur/fluffiness and this Topshop dress is the perfect option. Simple and chic black body con but with the fun touch of a fur hem- this is a favourite! 8- Topshop // I love this dress for all year round but it's particularly great for party season. It's silver and glittery and it's not such a boring shape with the asymmetric hem . Yet it still remains classic and easy to style. 9- George at Asda // If you're a tad bored of the dark colours, a cobalt blue is a great option this season. This George at Asda dress is super budget friendly and could easily be dressed up or down. 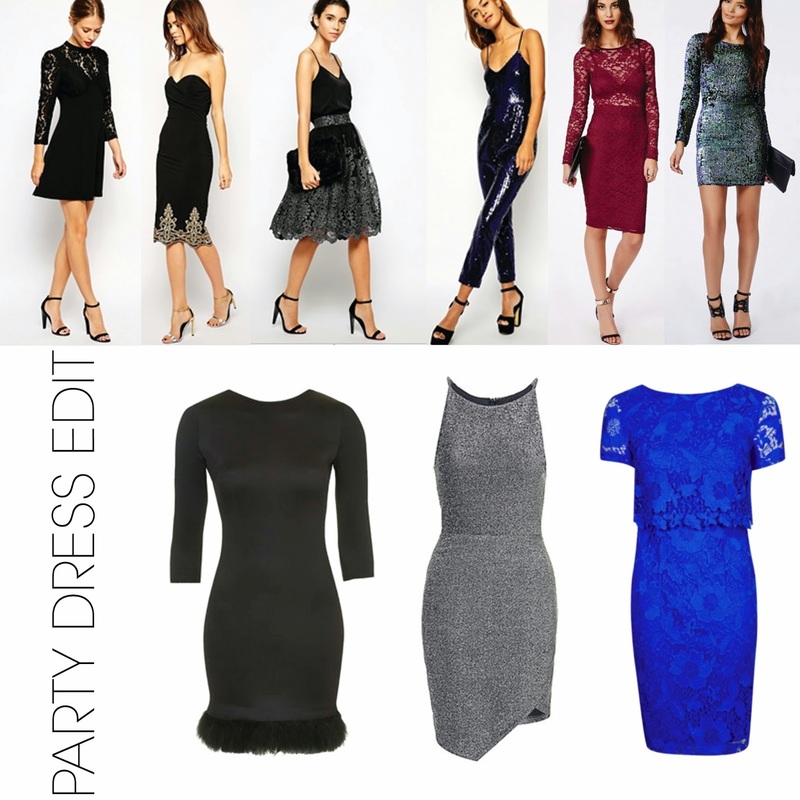 I hope you like the party dress edit and it has given you some ideas of how to approach your party shopping!